Officers Of Courage And Dedication Being Compensated With Imprisonment. A few predictions have been made that the New UNF Government will start the rut leading into a dangerous scenario of betrayal into the hands of the lurking LTTE and appear to be unfolding as reality this very moment. A group of elite LRRP Covert Operations Army Officers who created heavy inroads into the LTTE are being held in unsanitary conditions in Kandy under the Prevention Of Terrorism Act and is this the compensation these brave Sons Of Lanka are given for their heroics and their selfless dedication towards preserving the Territorial Integrity Of Sri Lanka? Shameful and Decorumless in the manner their movements have been linked to a possible security breach using Udathalawinna as the excuse by the Authorities and an expression of concern for their own security which in reality was more than secure even prior to the elections. Not only have the identities of these Officers been revealed to the general public in direct violation of the Army Ordinance and Regulations but the Administration has had the affront to transform them into lawbreakers which is a pathetic display of ingratitude towards some who have given their best towards their Motherland in an obtuse diplay of false righteousness where even Presidential Authority appears to have been bypassed. In what appears to have been an unpardonable breakdown of communications where instructions and conclusions between the Top Brass Of Security intermingled with the random conjecture of the New Administration trigger happy and quick to point fingers at the previous regime has resulted in mass confusion which has led to the turn of events splashed in headlines the World Over. The consequential meaningless arrests and holding of these Brave Officers needs immediate redress and their release secured to prevent further damage being done towards National Security and its very image which in recent times seems to be questionable. This was the very prediction made by the analysts who were univoiced in their belief that it would be a matter of time before the new Administration sets the ball rolling into uncertainty and there has even been suggestions that infighting between the rank and file of the Armed Forces could result and would be a welcome change for the LTTE to whom the Officers held in imprisonment were a sooth and efficient operational force much to their chagrin and wreaked havoc within their cadres in a manner reminiscent of Major General Janaka Perera. Is this a further confirmation that all obstacles in the path of the LTTE are being systematically removed regardless of World Opinion and that the hollow cries against what the ringleaders of LTTE support loosely term 'Sinhala Chauvinism' are being heeded in order to justify the projected predilections towards the LTTE as shown by the new Regime who regardless of posterity and the future of the Nation appear to be playing a dangerous game ? Labels: Officers Of Courage And Dedication Being Compensated With Imprisonment. LTTE's Political Head of Mannar District, Mr. Iniyavan, said Wednesday that there were two Claymore mines bound to a tree and wired to a triggering device operated a few meters away from the spot where LTTE Vavuniya West Political Co-ordinatar Major Jeyanthan was killed with a civilian supporter riding in a motorbike Tuesday. "A deep penetration unit of the Sri Lanka Army (SLA) is known to operate from the Iranai Illuppaikulam SLA base," Iniyavan told TamilNet after showing the site to Sri Lanka Monitoring Mission (SLMM) members Wednesday morning. The Claymore explosion that claimed the life of Maj. Jeyanthan, took place 4 km near Chinnavalayankattu, 47 km east of Mannar. LTTE Commander Mahenthi and Iniyavan showed the location to truce monitoring official Joakim Robertsson from the SLMM Mannar District Office (DO2) Wednesday morning at 11:30, he said. Iniyavan further said that the Tigers had registered the activities of the "deep penetrating units" operating from Iranai Illuppaikulam SLA base charging that these units were "re-engaged" in reconnaissance missions and ambush operations in violation of the Cease Fire Agreement. Major Jeyanthan, Liberation Tigers Vavuniya West area political head and a civilian, Mr. Vinotharan Thevarasa, were killed when a Claymore mine exploded hitting the motorbike in which they were riding in LTTE controlled area at Chinnavalaiyankattu, 45 km east of Mannar town, LTTE sources said. The Claymore mine was allegedly exploded by a group of Sri Lankan soldiers around 4:00 p.m. Tuesday, according to the sources. The LTTE official, Maj. Jeyanthan, killed in the Claymore attack was a disabled cadre who had lost one of his legs, the sources added. The bodies of Major Jeyanthan and Vinothan were taken to Kilinochchi. The ammunition seizures and the murder and kidnap of fishermen bring back bad memories of the LTTE's pre-1991 presence in Tamil Nadu. Fisherfolk protest against the killing of fishermen off the Thoothukudi coast, at Threspuram beach in Thoothukudi on March 30. THE recent developments relating to the Liberation Tigers of Tamil Eelam (LTTE) have raised serious security concerns on both sides of Palk Straits - in Tamil Nadu and Sri Lanka. The Sri Lankan ethnic issue has always cast a shadow in Tamil Nadu. The people of this southern State have not forgotten the violence let loose by the LTTE between 1989 and 1991. The recent spate of seizures of arms, weapons, ammunition, explosives and umpteen consignments of deadly raw materials for the manufacture of improvised explosive devices (IEDs) by the Tigers have added to their fears. The Union government is also under pressure as Indian shores are being used by a terrorist organisation to continue an armed struggle in a neighbouring country. Perhaps the most important seizure in recent months was an explosives-laden boat captured by the Coast Guard off Point Calimere on February 13. Its booty included an AK-56 assault rifle and an explosives-packed jacket that reminded people of the LTTE suicide bomber who assassinated former Prime Minister Rajiv Gandhi at Sriperumbudur on May 21, 1991. Where was this boat headed? What was it doing off the Cuddalore-Nagapattinam coast? Was another suicide mission in the offing? If so, where? Was the LTTE only using Tamil Nadu to source its requirements or was it also planning to perform another major operation on Indian soil? Such questions remain unanswered. Equally shocking for the people of Tamil Nadu was the news that five Tamil fishermen were killed in mid-sea and a dozen fishermen, including one from Kerala, were kidnapped by the LTTE. It was only after six full weeks after the mid-sea murders that Director-General of Police D. Mukherjee revealed that the Sea Tigers were behind both incidents. "If the Tamil Tigers can do this to the coastal fishermen, who have been their allies for over two decades, what will they not do to India?" says a former Research and Analysis Wing (RAW) officer, who has worked for years on the Sri Lankan Tamil issue and studied the functioning of the LTTE. In his opinion, the LTTE is "quite desperate" and is collecting arms, ammunition and materials vigorously for another offensive. The display of its air wing, albeit with light aircraft, may be another signal of what lies in store. The Tamil Nadu Police and Central agencies would not have unearthed these lurking tentacles of the LTTE but for a road accident near Madurai a few months ago, involving a vehicle carrying rocket shells and ball bearings allegedly intended for the LTTE. Investigations revealed some links. Central Intelligence agencies have sent out periodic warnings to the State police and government about the activities of the LTTE and the support extended to them by some political parties and fringe groups in Tamil Nadu. But it was only after this accident that the State police and administration sat up. Godowns stocked with ball bearings, scrap metal, aluminium ingots, rocket shells, boosters, explosives, arms and ammunition and trucks carrying these materials were seized in a matter of months from different parts of Tamil Nadu - notably from Madurai and the other southern districts. According to the State Police, seven cases were registered on these incidents and the `Q' branch has begun a detailed investigation. At least 64 persons were taken into custody at various stages and a network of operatives was unearthed. This network includes Sri Lankan Tamils (suspected militants) and fishermen in Ramanathapuram, Thoothukudi, and neighbouring coastal districts who have links with the Sea Tigers and the LTTE transport system. The nexus between coastal fishermen and the LTTE is more than two decades old. Pre-1983, the link was between Sri Lankan and Tamil fishing communities through inter-community marriages and cultural ties. But after the genocide of 1983 and the LTTE's "liberation struggle", smuggling and commercial operation started. Hundreds of fishermen fell into the dragnet of the Tigers and indulged in smuggling provisions, clothes and medicines, transporting injured cadres, and even storing weapons, arms and ammunition meant for the LTTE. It was only after Rajiv Gandhi was assassinated that a determined effort was made to cleanse Tamil Nadu of the LTTE and end the smuggling activities. With the passage of time, the smuggling of provisions, clothes, diesel and petrol resumed. During the attempts to initiate a peace process and "talks about talks" in the island, these activities ceased to some extent. But the Sri Lanka armed forces' drive in the past two years to contain the LTTE's military prowess has obviously forced the terrorist group to revive its activities in Tamil Nadu. The end of the All India Anna Dravida Munnetra Kazhagam (AIADMK) rule in Tamil Nadu, during which efforts were made to contain pro-LTTE elements and their activities in the State by invoking the Prevention of Terrorism Act (POTA) against a host of people, including political leaders, marked the beginning of the glorification of the LTTE and a propaganda campaign in its favour. Fringe groups that were previously under the scanner began a pro-LTTE campaign calling upon the Indian government to stop all assistance to the Sri Lankan government, and intervene to restore peace in the island nation. Central Intelligence officials are worried that some Tamil Nadu political parties that are part of the United Progressive Alliance (UPA) government at the Centre are strong supporters of the LTTE. In addition to the vocal and influential Pattali Makkal Katchi (PMK), and its close ally, the Viduthalai Siruthaigal (the Dalit Panthers of India), which have openly supported the LTTE, sections in the ruling Dravida Munnetra Kazhagam (DMK) took a soft line on the LTTE until recently. Vaiko, whose Marumalarchi Dravida Munnetra Kazhagam (MDMK) was part of the UPA until recently, is a votary of Tamil Eelam. Only after veteran politician and five-time Chief Minister M. Karunanidhi declared in the State Assembly that there was no room for the LTTE in the State and expressed shock over the involvement of Tamil Tigers in the murder and kidnap of Tamil fishermen did the decibel level of the pro-LTTE propaganda reduce. Taking the high moral ground, AIADMK leader and former Chief Minister Jayalalithaa has accused the DMK of taking a "soft line" on the LTTE and said, "This approach poses a grave threat to Tamil Nadu and it is highly condemnable." Unfortunately, in Tamil Nadu politicians and political parties appear to be unable to make a clear distinction between the cause of the Sri Lankan Tamils and the LTTE's agenda. Though the LTTE was at the forefront of the earlier phase of the ethnic struggle, Tamil politicians have turned a blind eye to the murder of Tamil leaders of the North and East in Sri Lanka by the LTTE. While the LTTE has always wanted to drum up emotional support for its cause in Tamil Nadu, it has paid little heed to repeated appeals to end the fratricidal war and focus on the rights of Tamils in the island. If Tamil Nadu and its political leaders do not realise the dangers of allowing the LTTE and its front organisations, including the fringe groups in the State, to continue their clandestine activities on Indian soil, another crisis will be inevitable. At a time when New Delhi has urged its neighbours - Bangladesh, Bhutan and Nepal - not to allow militant groups operating in India to use their soil, India cannot allow the LTTE to use Indian soil against Sri Lanka. What options are there before the Tamil Nadu government? A senior Intelligence Bureau official, who has visited Tamil Nadu to review the situation, said: "The State police, with the assistance of the Central Intelligence agencies, the Indian Navy, the Coast Guard and the Coastal Security Group, should launch a determined crackdown on the LTTE, its support groups and all their clandestine activities in Tamil Nadu and adjoining areas. A joint inspection of the coast should be undertaken by the Indian and Sri Lankan Navies. The Coast Guard must step up its surveillance in shallow waters and the identified landing spots of the LTTE. The network established here must be smashed." He went on to say that the Government of India must take a clear line on the LTTE and avoid allowing regional allies in Tamil Nadu to dictate the nuances of the policy on Sri Lanka. New Delhi must extend logistical and technical assistance to Sri Lanka to meet the heightened threat from the LTTE's sea and air wings, he said. The LTTE resorts to air raids as a desperate step and the low-intensity war in Sri Lanka escalates. Sri Lankan soldiers carrying out a search in a Vavuniya village where, according to the military, LTTE cadre had killed six women and a man. ON the night of May 3, after several hours of agonising over the April 29 aerial raid by the Liberation Tigers of Tamil Eelam (LTTE) on two fuel depots - one of them partly owned by the Indian Oil Corporation - that feed the Sri Lanka Air Force (SLAF), the political and military managers of the government of President Mahinda Rajapaksa decided to shut down the country's only international airport for night operations. The decision, to be effective from the night of May 9/10, is a costly one since an estimated 40 per cent of the civilian air traffic to and from the Bandaranayake International Airport (BIA) will have to be re-scheduled or cancelled. The government perhaps had no other option as the latest Tiger plane raid had plunged Colombo into chaos and any of the incoming international civilian flights could have suffered damage in the anti-aircraft fire from the guns triggered at several points. Such was the confusion on the day, when virtually the whole city kept awake to catch the Australia-Sri Lanka World Cup Cricket final live, that there were reports of ordinary citizens being injured and several buildings hit. On August 11 last year, the government shut down the A9 highway, though it is the only link to the Jaffna peninsula from the rest of the island, on grounds of national security. The government did not relent on demands for lifting the blockade, on the plea that it would offer the Tigers an excellent opportunity to collect illegal taxes to finance their war at a time when it was conducting a serious offensive to weaken their military muscle. The suspension of night-time operations at the BIA and the closure of A9 together mark a virtual acknowledgement that the undeclared low-intensity war between the government and the Tigers has escalated into a full-fledged, undeclared war. The development comes as no surprise to Sri Lanka watchers as 2007 was predicted to be a bloody year in the two-and-a-half-decade history of the ethnic conflict. The periodic bombings and political assassinations, the collapse of the Geneva-II talks in October, the November 27 declaration by LTTE supremo V. Prabakaran that "Sinhala duplicity of war and peace has left Tamils with little option but to fight for political independence" and the conclusion of the Rajapaksa government that there could be neither peace nor development as long as the LTTE was not defanged militarily, formed the build-up to the current situation. The war-like situation has already had a devastating impact on the ground. Estimates by the United Nations and other international agencies suggest that close to a million people have been displaced by the escalation of hostilities; they include those displaced by the 2004 tsunami. According to the Sri Lanka Monitoring Mission (SLMM), over 4,000 people were killed in the 15 months up to February 2007. The North and the East are reeling under a severe shortage of essential commodities and medical supplies. The educational system has almost collapsed. The tourism industry, which fetches about 30 per cent of Sri Lanka's foreign exchange revenues, is in a state of paralysis. Most of the pro-LTTE Tamil National Alliance (TNA) Members of Parliament have not had the courage to travel to their constituencies for periods varying from six to twelve months. A weekly flight to Jaffna is the only mode of transport that has been available since the A9 closure. With the LTTE air raids, the entire nation is psychologically wounded and there is a widespread paranoia. Adding to the woes of war is a spate of abductions and killings for ransom by paramilitaries and underworld gangs. A thousand such cases have been reported by non-governmental organisations (NGOs) looking into the phenomenon. In the matter of press freedom index, Sri Lanka has slumped from the 55th rank in 2002 to the 145th rank in 2007.
Who is responsible for this state of affairs? Undoubtedly the Tigers have to take the bulk of the blame, and the beginning of the current phase can be traced to the assassination of Foreign Affairs Minister Lakshman Kadirgamar in August 2005. Of course, the Rajapaksa government cannot escape blame completely. Instead of focussing on building consensus for an early resolution of the ethnic strife, it invested excessively in a military strategy. Managers of the government argue that they have convincing reasons to push the military strategy to the logical end as in their perception there is no way the Tigers would agree to any solution short of Eelam. The assessment is strengthened by the tape of a speech made by Prabakaran weeks after he lent his signature to the Cease Fire Agreement (CFA). In the tape, he is seen telling his senior commanders to use the CFA for a brief rest before the bigger battle. However, there is a flaw in the argument advanced by the Rajapaksa administration. Several political and non-political entities within and outside Sri Lanka have been trying to impress upon the government the need for an imaginative formula to resolve the conflict, pointing out that it is the only way to isolate the Tigers. The government does not seem to be impressed with the logic and insists on putting `annihilation' of Tiger military assets on top of its agenda. This mindset is reflected in the May 1 devolution package mooted by the ruling Sri Lanka Freedom Party (SLFP) headed by Rajapaksa. Little wonder that almost all the parties, pro- and anti-government, have denounced the proposals as inconsequential. These include abolition of the executive presidency and replacing it with the Cabinet system of government led by a Prime Minister, subject to consensus; making the district the unit for devolution of powers; and the creation of a bicameral legislature. The SLFP says the objectives of the package are to achieve "a lasting and honourable solution to the ethnic issue in the country"; to preserve the sovereignty and territorial integrity of Sri Lanka and the identities of different communities; and to ensure the peaceful coexistence of these communities. It recognises the multilingual, multireligious and multicultural character of Sri Lankan society. There will be strict implementation of the constitutional provision for the use of Sinhala and Tamil as the national languages. The package also includes a promise to establish two independent permanent commissions for land and water. The SLFP seeks to restore the parliamentary model of government. While the unit of devolution would be the district, two districts could amalgamate and form one unit. However, the amalgamating units should be in the same geographical division and be contiguous. Most political parties in Sri Lanka have termed the proposals as falling below expectations, impractical and unacceptable. The SLFP, however, defended them, saying that they were meant for wider debate and were not final. The most strident statement against the package came in the form of a joint statement from the Tamil United Liberation Front (TULF), the Eelam People's Revolutionary Liberation Front (EPRLF) and the People's Liberation Organisation of Tamil Eelam (PLOTE). Leaders of these parties are opposed to the LTTE and have stood behind Rajapaksa in his campaign to weaken the Tigers militarily. Yet, they were left with no option but to characterise the proposals as something that would not meet the aspirations of the Tamil people. "Instead of taking the peace process forward, it has made it difficult to find a reasonable solution. Furthermore, being the ruling party's proposal that should form the guideline for a solution, it had made even the proposals of other parties irrelevant," a statement signed by V. Anandasangree, D. Sidhathan and T. Sritharan said. The statement said the powers to be devolved under the SLFP proposals did not even come close to the powers vested with the provincial council, formed under the 13th amendment to the Constitution. The amendment is a by-product of the 1987 Indo-Sri Lanka Accord. It said: "Fifty years of agitation by the Tamil-speaking people to win their rights has brought them back to square one. After so much loss of life and destruction to property and having failed to find a solution under a unitary system, the Tamils will not accept any solution less than one under a Federal constitution." The EPDP, a constituent of the ruling combine, felt that the provincial councils should be the unit of power devolution. Party leader and Social Welfare Minister Douglas Devananda said the northern and eastern provinces should be remerged with more `asymmetric power' compared with other provinces. There should also be autonomous power-sharing arrangements for Muslims within the province, he said. Sri Lanka Muslim Congress leader and Post and Communications Minister Rauf Hakeem said the SLFP proposals fell short of his party's expectations. But it was prepared to discuss them further, he explained. The main opposition party, the United National Party (UNP), is yet to respond formally to the package. K.N. Choksy, UNP MP who represents his party at the All Party Representative Committee (APRC), said that the proposals for the establishment of district councils were impractical. He is of the view that there are good reasons for the UNP proposal to continue with the provincial council as the unit of devolution. Pro-LTTE TNA MP Suresh Premachandran said the proposals were a step backward and there was no point in discussing them. If the government could not understand the gravity of the `Tamil national question', there would be dire consequences, he said. However, the APRC Chairman, Minister Tissa Vitharana, is hopeful of building consensus on making the province the unit of devolution though the SLFP has favoured the district as the point for power-sharing as a solution to the ethnic issue. Vitharana's observations came even as the extremist Janatha Vimukthi Peramuna (JVP) joined several other parties in opposing the SLFP devolution package. The JVP has contended that the SLFP package is against Mahinda Chinthana, the November 2005 presidential election manifesto of Mahinda Rajapaksa. The party argues that the proposals do not envisage a provision to preserve the unitary character of the island nation. Vitharana told Frontline that the devolution package made by the SLFP was not a final document and would be subject to discussion and amendments at the APRC. "The APRC at the last meeting agreed that the basis for future discussion should be the document circulated by the APRC Chairman. The APRC also agreed that where they differ from the proposals, they would submit specific amendments," he said. According to insiders in the SLFP, the President at the moment has deliberately opted for a `minimalist approach' as it would leave scope for bargaining with various parties in a bid to build consensus. It appears that the SLFP draft initially proposed the province as the unit for devolution but it was changed in the last minute. 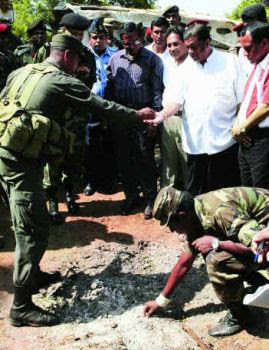 A military investigation team at the site in Colombo where an LTTE aircraft dropped a bomb. The issue is not expected to be settled immediately and the focus will continue to be firmly on the undeclared war. The top-most priority of the government is to neutralise the nascent air wing of the Tigers, and Colombo and New Delhi are jointly working on a strategy. Besides the two air raids in Colombo, Tiger planes attacked the Palaly airbase in Jaffna on April 23. The stories coming from the LTTE and the government are highly divergent but it seems that at least six soldiers were killed and some ammunition storage facilities were damaged. This has, however, not been confirmed by the SLMM. From the SLAF side, attacks continued on the Vanni area. There were eight reported air strikes inside Vanni, of which three were carried out at night. The latest situation report of the SLMM, dated April 30, noted, "It seems that SLAF emphasis has shifted somewhat from the Eastern Coastal areas to areas closer to Kilinochchi. Half the above air strikes have taken place within 8 km from the town and one as close as 3 km from the SLMM office." In the northern and eastern areas the situation remains tense. In Jaffna, there was shelling throughout the week after the heavy shelling on May 1. Unless something dramatic happens, the situation can get worse in the coming days and weeks. There are efforts by players outside the island nation, such as a British parliamentary group, to hold a summit meeting of the government, the Tigers and Norway, the peace broker. But, given the current mood such efforts are not likely to bear fruit. Labels: The LTTE resorts to air raids as a desperate step and the low-intensity war in Sri Lanka escalates. Kandiah Ulaganathan known to the world as "Col" Ramanan of the Liberation Tigers of Tamil Eelam (LTTE) was killed on Sunday May 21st. Ramanan fell victim to a sniper or hidden gunman as he was inspecting the forward defence lines (FDL's)at Vavunatheevu in the region known as "Paduvaankarai" (Shore of the setting sun) on the west of Mattakkalappu Vaavi or Batticaloa lagoon. Ramanan was a senior commander serving with the tigers since 1986. Rising from the ranks he has held many different positions within LTTE folds during the course of his tumultous career as freedom fighter. It was only a few weeks ago that Ramanan was made Lt. Col and nominated as deputy - military commmander of Batticaloa - Amparai LTTE by tiger supremo Velupillai Pirapakaran. "Col' Bhanu from Ariyalai in the North ern Province is in overall charge for Batticaloa - Amparai districts as Special Commander. Senior tiger leader Nagesh had been appointed military - commander for both districts with Ramanan as his deputy. Both Nagesh and Ramanan are sons of the Eastern soil. In addition to being deputy military commander Ramanan was also supervising the intelligence wing in the region with Keerthy running day to day affairs. Ramanan had been on an inspection tour of LTTE positions along the lagoon shores from noon that Sunday. He was almost winding up that evening when he reached Vavunatheevu. He was chatting merrily with tiger cadres manning the frontline outposts when an accurate bullet from a sniper's rifle smashed into his skull. Even as Ramanan fell his body guards and other tiger cadres at the FDL's fired away all round hoping to hit the elusive enemy. But it was of no use as the assassin was a solitary sniper lurking on top of a tree in the no man's land between the Government of Sri Lanka (GOSL) controlled territory and areas under tiger control. The distance between GOSL and LTTE positions was about 350 to 375 metres. There were many trees in this space and the sniper had been concealed on the branch of one tree. The trajectory of the bullet which entered the back of Ramanan's head suggested that say informed Tamil sources. Since Ramanan's back was turned he would not have had the slightest inkling about what hit him. The LTTE cadres carried Ramanan towards the interior and applied immediate first aid. Thereafter they rushed him to a nearby medical clinic. But Ramanan was no more. He had died within 15 to 20 minutes of the firing which took place around 5. 30 - 35 pm. It was apparent from the smoothness of the operation that a cool, efficient assassin was responsible. The LTTE charged the army of being responsible. Given the sniper position's proximity to the Vavunatheevu army camp and its forward defence lines the tiger accusation seemed valid.It seemed that some member of the special forces with excellent sniping skills was responsible. But the renegade faction of the LTTE led by former Eastern tiger special commander Vinayagamoorthy Muraleetharan alias "Col" Karuna jumped in with the claim that they were responsible. The Karuna faction is called Tamil Eelam Makkal Viduthalaip Puligal (TEMVP). It has an office at Govington road in Batticaloa town. This is a house that belonged to former Batticaloa Parliamentarian Sam Thambimuthu who along with his wife Kala was killed by the LTTE in 1990.The house was later used by the Eelam Revolutionary Organization (EROS) as an office. The TEMVP has a spokesperson called Thooyavan. Statements were released in his name that they were responsible for Ramanan's killing. 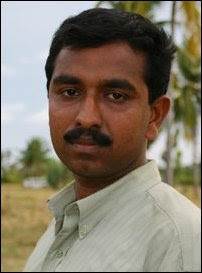 Later Thooyavan was interviewed by the BBC Tamil Service. He claimed that TEMVP cadres had launched an ambush. First a landmine was triggered and then there was firing said "Thooyavan". Thooyavan's answers however did not sound convincing when Ethiraj Anbarasan of "Thamizhosai" probed him about the incident. The official stance of the Mahinda Rajapakse regime on the question of Karuna and his men is that no alternative armed groups are operating in GOSL areas. The TEMVP office in Batticaloa is a political office. So Thooyavan says that his comrades operating in tiger held areas were responsible. But anyone familiar with the geography of the area where Ramanan was assassinated will realise that even infiltrating the place let alone operating from there is virtually impossible. This stretch of land has the lagoon one side as border. It is more agrarian with comparatively little forest cover. With the LTTE well - fortified here infiltrating the area from the interior can be ruled out. Apart from the TEMVP claim there is no information about any landmine ambush or exchange of fire having taken place in the area. Only a lone sniper possibly with a sidekick seems to have been busy. The only way to get into the no mans land would be through the FDL's of either side. Since the LTTE would not have done so the obvious conclusion is that it would have been from the army controlled side. The few attacks on LTTE sentries and bunkers in this area have all been launched by persons coming from the Vavunatheevu army premises. Those responsible for such hit and run acts returned to the army camp promptly. In this case too the inescapable conclusion seems to be that the sniper came into the buffer zone from the army camp premises. It does not matter whether the actual assassin was a soldier or Karunas cadre. What matters is that he or she could not have done so without the army factor. It is on this basis perhaps that the LTTE keeps on saying that the army was responsible despite the TEMVP jumping up like jackrabbits to claim "credit". Another reason could be the LTTE feeling that even accusing the Karuna faction of such smooth sniping would be infra - dig. Usually it is the LTTE that has achieved sniping credits like that of Thambirajah Subathiran alias Robert of the Eelam Peoples Revolutionary Liberation Front (Varathar faction) in Jaffna town. It is very possible that there are crack shots within the Karuna faction too. Even if the actual sniper was not from the Karuna faction three important facts have come to light through this incident. Firstly it implicates the Vavunatheevu army camp in the killing. Secondly the "responsibility" claim made by Thooyavan from an office within Batticaloa town demonstrates that the Karuna faction is linked to unprovoked anti - tiger violence while being in GOSL controlled areas. Thirdly the marksman lying in wait for Ramanan to turn up shows that either there was a leak from within the LTTE or that tiger leaders had been very predictable in their routine and movements. The killing of Ramanan would no doubt have brought much joy to his one time chief Karuna. As stated in these columns earlier Ramanan too was initially aligned to Karuna when the LTTE split occurred. Like many of the Eastern senior tigers like Ramesh, Karikalan, Prabha, Ram and others Ramanan too stood with Karuna when the latter rebelled against Kilinochchi. It was Ramanan who was functioning as head of the Batticaloa - Amparai intelligence under Karuna when the LTTE cracked. Acting under Karunas orders Ramanan arrested a number of LTTE intelligence operatives including Keerthi who were reporting directly to Pottu Amman. They were detained at Kannankudah. Yet in what seemed a remarkable "somersault" at that time Ramanan freed those detenues and escaped to the Wanni with them. Others like Ramesh and Karikalan followeed. Kausalyan who refused to throw in his lot with Karuna had already reached Kilinochchi. It was the deserting of Karuna by these seniors that strengthened Prabakharans hand. It was also suspected by Karuna that Ramanan had always been loyal to Prabakharan and that he had functioned as an "agent" for Kilinochchi. This was realised by Prabakharan himself who warned Ramanan that he would be number one target for Karuna in taking revenge. This warning was given by the LTTE leader to Ramanan during a four hour conversation in 2004 during which LTTE deputy military chief "Col" Balraj was present. There were other reasons too for Karuna and his followers to be furious with Ramanan. When the LTTE forces under "Col" Sornam launched the Good Friday counter - offensive in 2004 against Karuna Ramanan played a major role in hoodwinking Karuna faction cadres guarding the Verugal river. Some tigers pretended to be switching loyalties and crossed over. They then turned tables on unsuspecting Karuna cadres. Thereafter others from the Trincomalee side too crossed over. Thereafter all hell was let loose. Many Karuna cadres were shot dead in cold blood and dumped in the Verugal river. Ramanan's role in this received condemnation. Then came the Sri Lankan defence establishment's "betrayal" of Karuna. Soldiers manning points in Koralaipattru North division were instructed to turn a blind eye to mainstream LTTE personnel moving into GOSL areas from the North. A tiger brigade led by Ramanan was the first to enter GOSL areas and cross the Valaichenai - Polonnaruwa road. Suddenly the tigers were in Karuna's rear. Karuna never expected this to happen . This was a crucial factor in Karuna quitting positional warfare then. Later Ramanan was engaged in counter - intelligence activity against Karuna cadres, He even came to Colombo for a while to oversee these operations. One such act was the infamous massacre at Kottawa where eight Karuna cadres were shot in their sleep.Another inmate in the safe house had been "turned" into drugging the food surreptitiously and then calling the tigers in. Another was the manner in which four senior tigresses including Nilavini and Laavanyaa who were loyal to Karuna were captured.in Colombo. Ramanan had abducted their close relatives in Batticaloa and then got to these girls through them They were later paraded in a press conference as having escaped from Karuna's clutches. Ramanan also played a prominent role in tracking down many of the LTTE cadres who quit after the split. Many youngsters were seized forcibly and transported to the Wanni. Under these circumstances it seems obvious that Ramanan was high on the Karuna faction list for vengeance. Whichever the hand that pulled the trigger there is no denying that there is much jubiliation in the ranks of Karuna. Ramanan or Kandiah Ulaganathan like Karuna was born in 1966. He is a native of Palugaamam. Ramanan was one of ten children. The family was agriculturist but did not own much land. Ramanan studied at the Kandumani Maha Vidyalayam in Palugamam and completed his "A" levels but did not get Varsity admission. Ramanan's elder brother who joined the EPRLF was the first from the family to join a militant movement. He quit the EPRLF after it began collaborating with the Indian Army in 1987. He then teamed up with the LTTE and was killed in a skirmish with the IPKF in 1988. Ramanan was first a tiger helper during the period when Aruna was LTTE Batticaloa commander. He joined the LTTE formally in 1986 when Kumarappah was Batticaloa tiger chief.Ramanan was trained locally and not in India. He was of the third Eastern batch to be trained at the Kanchikudicharu jungle base. Ramanan started out as a cadre under the command of Reagan the tiger leader from Vellaveli. Ramanan's first battlefront experience was in 1987 when the LTTE engaged in fighting the Sri Lankan army at Ambilanthurai.. It was during the Indian army period that Ramanan made his mark as a group leader . He once led a successful attack on an IPKF patrol in Palugamam with the aid of a single LMG. In another attack led by Ramanan an IPKF bunker in Kokkatticholai was destroyed. After the IPKF period Ramanan worked closely with Newton in Batticaloa and learnt many intelligence techniques from him. He also joined the first Eastern Tamil infantry division Jeyanthan Brigade Apart from minor skirmishes in the East the Jeyanthan brigade was also deployed at times in the North. Ramanan too went along and participated in the Pooneryn - Nagathevanthurai attack in 1993 and some of the operational battles of Jayasikurui and Oyatha Alaigal between 1996 - 99. He also received specialised intelligence training under Pottu Amman during these years. Ramanan functioned as deputy intelligence chief under Nizam for a while. After Major Nizam was killed by a deep penetration assassination squad Ramanan became acting intelligence chief. Later he was made intelligence chief on a permanent basis. Among two prominent operations planned and supervised personally by Ramanan were the killing of former STF deputy commandant Sahabandhu and the EPRLF paramilitary group leader Razeek. There was also a time when Pottu Amman used the Batticaloa "route" to send bombs and assassins to Colombo. Ramanan was Pottu's point man in many of these and was intensely involved along with Newton. Ramanan had a reputation for being tough and controversial. Some of his actions proved counter- productive. Ramanan along with people like Kaushalyan was responsible for the land distribution scheme done by the LTTE in the East. Given his social background Ramanan was against the "podiar" or big land owner system. Large tracts of land belonging to Tamil and Muslim landowners were seized and parcelled out in small allotments to poor. landless families. Fragmenting productive land along with the lack of a sustainable support system led to most new owners abandoning agriculture and the scheme failing miserably.Today most of these once fertile lands lie barren and the rice bowl of Lanka has become a dust bowl. Another of Ramanan's actions which caused much resentment was the destruction of nine Hindu temples in the region. These temples were owned by some feudal upper - class "Vannakkar" families. Ramanan in his zeal for social reform demolished these temples and erected other buildings in their place. In one place a fish market came up on temple premises. This caused much heartburn and finally Ramanan had to be restrained on direct orders from Pirapakaran. Ramanan was also cruel and hard in inflicting punishment. The fate of one victim who lives to tell the tale is illuminating. This was an Eastern academic once tipped to be Vice - Chancellor of the Eastern University. He was also a close relative of a prominent journalist affiliated to the LTTE. The man was on assignment in Colombo for an International Institution when the Karuna revolt occurred. The academic was interviewed by a reputed media organization about it. Some of the comments made pointed out that regionalism was a factor in Eastern Tamil politics. The tigers were offended. Later the academic returned to Batticaloa. He was immediately taken by the LTTE to Paduvaankarai. Ramanan personally was in charge of "interrogation". The man who was eminently qualified to be a future head of Batticaloa varsity was manacled and handcuffed. One method of inflicting pain was to strap both thighs together and make him walk in chains. Ramanan repeatedly told him that a decision to kill him had been taken on the day of the offensive media interview itself. It was only high - level pressure from various quarters that secured the academics release. He is now living abroad after being warned never to go public about his experience. This then was Ramanan a man who was no respecter of human life, dignity or values when it came to his goal and mission. A sad indictment of how war and conflict brutalises and distorts values .Ramanan is not a solitary example in that respect.There are many such mirror images of him in the LTTE, Sri Lankan armed forces and paramilitary groups too. After the Karuna revolt was contained Ramanan was made commander of the Mavadimunmarikottam zone. Then came the recent elevation as deputy - military commander for Baatticaloa - Amparai districts. Even before he could demonstrate his abilities in that command fate in the form of a sniper struck. Ramanan was posthumously promoted as "Colonel". He is the fourth tiger and first Easterner to be made Colonel post - humously. The first was Kittu who committed suicide at sea when the Indian navy encircled the ship he was travelling in. Then came Shankar who was killed by a deep penetration assassination squad landmine in Oddisuddan. The third was Raju who died while receiving surgery in Malaysia. Two of Ramanan's brothers and a sister are members of the LTTE. In the early nineties the Sri Lankan army blasted his mothers house as retaliation for an operation masterminded by Ramanan. In 2004 Karuna destroyed Ramanan's own house as retribution for deserting him and going to Kilinochchi. Ramanan married Vedha , a former LTTE woman militant from Mahiladitheevu.They have two children. His family was staying in Puthukkudiyiruppu in the Wanni. Ramanan's wife assisted by the Red Cross came over to Batticaloa for the funeral. Given the current security situation it was not possible to take Ramanan's body to the Wanni. Special commemorative ceremonies were held in Kilinochchi and Puthukudiyiruppu with people like Col. Balraj, Col. Jeyam , Lt. Col Ramesh . Ilanthitaiyan "Marshall", KV Balakumaran and Pottu Amman participating. In Batticaloa Ramanan's body was taken in procession and displayed for the public to pay their respects. Black flags and posters appeared. There was also a work stoppage. Yet all these were in LTTE controlled areas and not in GOSL areas. The final farewell to Ramanan was on May 21st at Thandiyadi. Col. Bhanu, political chief Dayamohan, Womens wing leader Kuveni and TNA Parliamentarian Aiyanendran spoke at the funeral. Though many people from the tiger controlled areas were present those from GOSL areas were conspicuous by their absence. Even Independent Tamil media was not present. This was in sharp contrast to Kaushalyan's funeral. Kandiah Ulaganathan's body was finally laid to rest at the tiger great heroes cemetery in Thandiaddy. One noticeable feature in all this was the absence of a public statement on Ramanan by LTTE chief Prabakharan. I did not see anything of the sort in the media. There is no doubt that Ramanan's death is an irreparable loss to Prabakharan. His death will not go avenged. That would be the way perhaps that the tiger supremo would mourn the loss of his able lieutnenant. Lankan military installations in the Jaffna peninsula. LARGE-SCALE fighting has erupted again in the predominantly Tamil Jaffna peninsula in the north of Sri Lanka. The latest confrontation began around midnight on March 26 when the Liberation Tigers of Tamil Eelam (LTTE) launched a multi-pronged offensive o n military installations in the peninsula. For the people of Sri Lanka, factual news about the situation is hard to come by owing to the censorship in force. On the other hand, news reports in the print, electronic, audio and visual Tamil media outlets a broad, along with information gained over the telephone from informed sources in Jaffna, provide an insight into the LTTE's war strategy in the peninsula and related developments. The LTTE is adopting a different military strategy in the peninsula (see "Tactical shift", Frontline, January 7, 2000). The prize targets are Jaffna town and the Elephant Pass military complex. There are four underlying principles beneath the curr ent strategy. First, the LTTE does not want a repeat of the fiasco of 1991 when it attacked the Elephant Pass camp directly, and is avoiding an all-out onslaught. Second, the Tigers are looking to cut off all access and supply routes to the Elephant Pass isthmus and s trangulate the forces stationed there. Third, the LTTE had already entered the peninsula through points in the eastern and southern coasts and established entrenched positions that the Army has been unable to demolish; it now seeks to extend these positi ons further. Fourth, the Tigers are keeping in reserve a large contingent on the northern mainland, which could be deployed to capture Jaffna town. What is unfolding in the peninsula is stage four of the third phase of "Operation Oyatha Alaigal" (Unceasing Waves). The first phase was in Mullaitheevu in July 1996, and the second in Kilinochchi in September 1998. In the third phase, the first stage wa s played out in the eastern sector of the northern mainland of the Wanni and the second stage in the western sector; both happened in November 1999. The third stage was launched in December 1999 and was focussed on the southern, southeastern and eastern flanks of the peninsula. The LTTE began occupying the coastal areas of Vettilaikerny, Kattaikkadu, Aaliyawalai, Uduthurai, Mulliyan, Thattuvaankoddi and Nallathannithoduvaai in the southeastern sector of the peninsula. It also seized Pullaveli to the north of Elephant Pass and K urinchatheevu to the west of the Pass. It had earlier taken Paranthan and Umaiaalpuram to the south of the Pass, on the northern mainland. Consequently, Elephant Pass was encircled on almost all sides and all access and supply routes were cut off - except for Iyakkachi to its north. The LTTE siege of Elephant Pass in 1991 was broken only by establishing a beachhead in the Vettilaikerny-Katt aikkaadu region. Subsequently, permanent camps were set up to ensure smooth supplies by the sea route. Prior to the current round of fighting, the Iyakkachi camp, along a bend on the strategic A 9 Highway, served as the gateway to Elephant Pass. Supplies came by road from Jaffna via the Kandy road. The LTTE has also established fixed positions on the southwestern sectors of the peninsula - in east Ariyalai, Koilakkandy, Thanankilappu and Keratheevu. Boats plying the Jaffna lagoon from the Pooneryn, Nagathevanthurai and Sangupiddy areas of the mainl and serve a logistical purpose. A battery of long-range artillery guns maintained on the Pooneryn coast fire intermittently across the lagoon into the Thenmaratchy sector of the peninsula. A key focus is Kilaly on the southwestern coast of the peninsula. Between 1990 and 1995, when the LTTE was in control of Jaffna, the Kilaly ferry was for long the transit point for persons entering and exiting from the peninsula. In response to the "creeping advantage" that the Tigers were gaining in the peninsula, Colombo stationed the entire 54 Division in the Elephant Pass sector. More important, the elite 53 Division, which consists of crack commando forces trained in Pakista n and in the United States and the special air brigade, was deployed on the east coast of the peninsula. This division was in the vanguard of successful military operations in Jaffna during 1995-96 and in the Wanni in 1997-98. Further, Colombo newspapers quoting military intelligence sources warned of a heavy build-up by the LTTE in the mainland areas south of the peninsula. Apparently, the armed forces were planning a major operation aimed at recapturing LTTE-held areas in the peninsula and the mainlan d when the LTTE struck. News reports indicate that the LTTE pre-empted an attack by the armed forces by some 48 hours. AROUND midnight on March 26, LTTE cadres infiltrated military lines and launched a commando-type raid on an artillery installation and ammunition dump in the general area of Pallai, which is a key junction to the north of Elephant Pass on the Jaffna-Kand y road. At least 11 pieces of artillery were decommissioned. The artillery points, installed in a fan-like formation, controlled the roadway beyond Pallai on the A 9 Highway. This operation was conducted by squads of the LTTE commando division known as " Siruthai" (Leopard). At about the same time, LTTE cadres also seized strategic points on the Jaffna-Kandy road. LTTE pickets were established to the north of Pallai in Muhamalai, Indrapuram and Ithavil. The LTTE has taken over an area 4.5 kilometres long and 1.5 km wide, ent renched itself in this swathe and fortified its positions. If the Tigers are able to hold on to this position, no road transport is possible along this road from Iyakkachi and Elephant Pass to Jaffna. That the Tigers perceive a big strategic value in thi s is clear from the fact that Balraj, their deputy military chief who is second only to Velupillai Prabakaran in the LTTE hierarchy, is leading them in this area. The Sri Lankan armed forces are trying hard to dislodge the LTTE from this position. There have been frequent exchanges of artillery fire. At least two offensives led by the armoured and mechanical divisions have been conducted and the LTTE has withstood both these. The Tigers also claim to have captured two South African-made "Buffel" tanks and three armoured cars and destroyed two tanks and five armoured cars. The LTTE has established an artillery division named after former Jaffna commander Kittu and is putting together an armoured division named Victor after the former "commander" of Mannar. Bhanu, former commander of Jaffna and Mannar, is in charge of both of these and assists Balraj. The armed forces have been forced to take a circuitous route - turning west from Pallai, and passing through Puloppalai and Kilaly and proceeding by the southwestern coast to Kachai and then heading east to the Jaffna-Kandy road at Kodikamam. However, th ere are reports that LTTE artillery is pounding the Kilaly-Kachai-Kodikamam area. All passenger traffic has been stopped along the Jaffna-Kandy road from the south of Chavakachcheri. One can conclude from this that the Army's land route to Elephant Pass is now under pressure. Owing to the ban on civilian traffic, more than 15,000 displaced persons who wish to flee the battle zone are trapped. In addition, all governmental work and activities by non-governmental organisations have come to a standstill. A serious humanitarian c risis is brewing: the displaced persons do not have access to adequate food, shelter and medicines. The Catholic Church meets some of these needs, but it does not have enough resources. Meanwhile, Tiger propagandists are accusing the troops of deliberate ly restricting civilian movement in the war zone so as to utilise them as human shields or buffers. THE Iyakkachi camp and the Elephant Pass complex too are under attack. LTTE cadres have kept up an artillery barrage and have both the camps under virtual siege from points to the north and northeast of Iyakkachi in Sangathaar Vayal and Kovil Vayal and p oints in the southeast of Elephant Pass at Thattuvankotti and to the west at Kurinchatheevu. Consequently, although the LTTE has not conducted a direct assault, Elephant Pass and Iyakkachi are marooned, and will remain so - unless the military balance in these areas changes dramatically. Even as the attacks in the Pallai-Muhamalai area were launched on March 26, LTTE cadres initiated a number of attacks on points along the east coast. The east coast, known as the Vadamaratchy East division, extends about 30 km from Point Pedro to Thalaia dy, bounded on one side by the sea and on the other by the Jaffna lagoon. It is sparsely populated, and fishing is the primary means of livelihood. 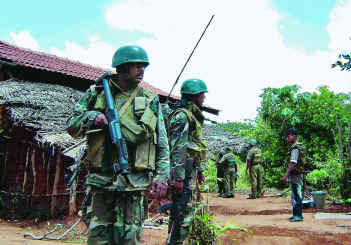 LTTE cadres launched their attack from Nelliyan, a tiny hamlet in the interior to the west of Thalaiady. 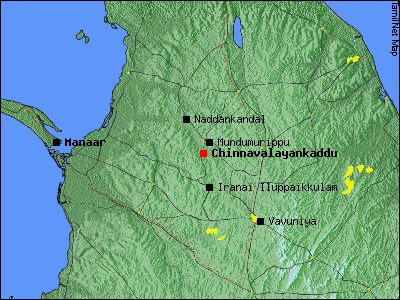 A ferocious attack was unleashed on the military complex of Thalaiady-Maruthankerni-Chembianpattru. Chembianpattru is about 2 km north of Thalaiady; Maruthankerni is less than a kilometre to its west. The three make up the vertices of a triangle that includes a military complex that served as the operational headquarters of the 53 Division. Fighting erupted also on the Soranpattru-Maasaar areas on th e road going west from Maruthankerni to join the Jaffna-Kandy road at the Puthukkaadu junction. Simultaneously, other Tiger groups attacked the camp on Maamunai and Amban further north along the coast between Chembianpattru and Nagarkovil. Official press releases stated that in the face of the LTTE attacks, the armed forces withdrew - first from th e smaller Amban camp, then from the larger Maamunai camp and finally from the massive complex at Thalaiady-Maruthankerny-Chembianpattru. Acco-rding to official communiques, the Army is repositioning itself: it is abandoning the coastal strip and reinforc ing positions in the interior to the west of the lagoon. This strategy is aimed at containing LTTE encroachment in the interior areas. As a result, the LTTE is now in control of the eastern coast up to Kudarappu to the south of Nagarkovil. It has taken new territory stretching to about 14 km. There are, however, three other camps - in Nagarkovil, Manalkaadu and Vallipuram - along this c oast between the LTTE positions and Point Pedro, the northernmost point of the peninsula. Women cadres of the LTTE's Sothiya brigade now hold the newly taken areas on the east coast. The attack was a joint operation undertaken by the Charles Anthony infantry division and the Sea Tigers division. Tiger cadres were ferried by sea from Challai on the Mullaitheevu coast, which was under LTTE control, and dropped off at points between Nag arkovil and Vettilaikerny, including Chembianpattru and Thalaiady. The Sea Tigers were led by Veerendran and the land-based cadres by Vasanthan, of whom little is known. While these attacks were on, Theepan, LTTE commander in the Kilinochchi area, led about 400 cadres on foot across the Chundikulam lagoon (which is now marshy) in the southeast of the peninsula. These cadres enhanced the Tiger presence in the south and so utheast of the peninsula and launched an attack on Army positions in the Vathirayan area to the west of Vettilaikerny and east of Elephant Pass. The armed forces have put up stiff resistance. If the Tigers break through beyond Vathirayan, Elephant Pass is likely to be assailed from another point. But since the LTTE now controls the eastern seaboard from Kokkuthoduvaai in Mulaitheevu district on t he mainland to Kudaarappu on the Jaffna peninsula, it is no longer dependent on the sea route. Except during the monsoon season, the Chundikulam lagoon can be crossed on foot. The British Broadcasting Corporation's (BBC) Tamil service on the radio, Tamil Osai, has meanwhile drawn attention to other serious developments. It reported that some Army positions in the interior of Kudathanai, Mulli, Kodikamam, Manthuvil and Varani a reas had been vacated and the personnel redeployed. This, according to the BBC, means that the Tigers can circumvent Army positions by taking a circuitous path by the lagoon shore and proceed to places such as Anthanathidal, Kappoothu, Mattuvil and Vadha ravathai without facing the Army anywhere. Given the geography of the peninsula, particularly the porous lagoon, the Tigers can reach the Vadamaratchy and Thenmaratchy areas and certain parts of the Valigamamam sector through this route. The LTTE also attempted to cross the lagoon and seize Kilaly on the southwest, but the armed forces have repulsed them. The LTTE's objective appears to be to seize the Maruthankerny-Puthukkaadu road on the east of the A 9 Highway and the Pallai-Puloppala i-Kilaly road on the west while holding on to its positions on the Jaffna-Kandy road. If it does this, it will have succeeded in bisecting the lower portion of the peninsula and trapping the troops at the Elephant Pass and Iyakkachi garrisons. At the sam e time it persists with its strategy to encircle the troops without attacking Elephant Pass directly. A significant aspect of the current phase of fighting is the LTTE's excessive reliance on long-range artillery. It is stated that only a force of around 1,500 cadres is used for direct combat in the peninsula. These cadres have been drawn from the infant ry, commando, artillery and armoured divisions as also the women's brigades and the Sea Tigers. As is customary whenever the Tigers are militarily successful, the LTTE propaganda machinery abroad claims that the overall strategy was drawn up by Prabakara n.
Of great concern to the Sri Lankan Government is the view that is gaining ground that the Tigers are planning to attack Jaffna shortly. LTTE ideologue and political adviser Anton Balasingham stated in an interview to the pro-LTTE fortnightly Tamil Gua rdian that the Tigers would soon be at the gates of Jaffna town, the cultural capital of Sri Lankan Tamils. Reports from Sri Lankan intelligence agencies have reinforced Colombo's apprehensions. These reports state that LTTE cadres are being ferried into the peninsula from Sangupiddy to Keratheevu. And, armaments are being stockpiled in Thanankilappu and East Arialai on the peninsula, evidently in anticipation of a massive military operation. It is also stated that senior military commander Karuna alias Karuna Amman is waiting along with about 1,000 cadres on the mainland coast adjacent to the peninsula. Colombo's fear is that the LTTE may use Thanankilappu or Ariyalai as a launch-pad for onsla ughts on Chavakachcheri or Jaffna town or both. Even if the Tigers cannot capture Jaffna at present, a lightning raid can inflict military, political and psychological damage. While the current round of fighting seems to be centred on Elephant Pass, one cannot rule out a surprise twist to events. Given its established positions in the peninsula, the LTTE is capable of changing course and targeting Jaffna town, Chavakachcheri o r Point Pedro. Colombo knows that even if the LTTE cannot seize these places, it would have scored a symbolic and psychological victory merely by launching an attack, particularly if it targets Jaffna. When it lost Jaffna, the LTTE suffered a loss of fac e. According to Tiger sources, Prabakaran has vowed that the Tigers will be in Jaffna by the end of this year. As compared to Jaffna, Elephant Pass is not vital for the LTTE because although it is the gateway to the Jaffna peninsula, it has never been under LTTE control. Even when the LTTE retained control over much of the peninsula and the northern mainland, Ele phant Pass was not in its grasp. Nor was it militarily significant. Further, the terrain around the Elephant Pass camp does not support an all-out attack or a direct siege, a lesson learnt in 1991 when the LTTE launched Operation Tharai Kadal Aahayam (La nd Sea Air). It is possible, therefore, that Prabakaran may seek to take Jaffna rather than Elephant Pass. His current strategy of strangulating the camp may be a protracted but relatively practical course. But the fall of either Jaffna or Elephant Pass would be demoralising to the armed forces. On the other hand, despite LTTE successes and claims, the armed forces cannot be written off, on account of two factors. One is that the number of LTTE cadres in the peninsula is dangerously low and even these are sandwiched between the 54 Division (Elep hant Pass) and the 53 Division (Pachilaipalli) in one sector and the 51 Division (Vadamaratchy) and 52 Division (Thenmaratchy) in others. The numbers are against the LTTE. Second, the advantage of an air force is palpable, and here the LTTE suffers. The current exercise has witnessed incessant aerial bombardment and shelling by the Air Force. A number of LTTE boats have been destroyed and expeditions foiled. Further, given the situation on the ground and at sea, the skies have considerable logistical importance for the armed forces. The LTTE's anti-aircraft wing, led by Shankar, has attempted to counter the Air Force with missiles and .50-calibre long-range guns, but the air advantage has enabled Colombo to contain the LTTE to an extent. President Chandrika Kumaratunga is in an unenviable position as she sees her war-for-peace strategy crumbling. Yet she perseveres and keeps herself informed of battlefront developments round the clock. After a recent meeting of the emergency war council, she instructed the three Service chiefs to relocate to the Palaly base in Jaffna until the current LTTE advance is halted. "Stay in Jaffna and do your duty," was her crisp command. Kumaratunga has also gone on record that there would be no ceasefire or withdrawal of troops from Jaffna "even if the LTTE kills me". After 10 days of fighting, the LTTE said that about 100 of its cadres had been killed. The Defence Ministry said that around 200 of its men were killed or were missing in action, and that nearly a 1,000 others had been injured. Unofficial estimates of th e casualty figures on both sides are considerably high. Predictably, each side exaggerated the casualty figures in respect of the other. The current LTTE offensive comes at a time when a peace initiative has been undertaken with Norway acting as a facilitator (Frontline, March 17, 2000 ). As a prelude to talks, the LTTE wanted a ceasefire to be put in place and the armed forces in Jaffna confined to the barracks. The government, however, did not agree to this. Colombo ruled out a ceasefire, but said that it would consider a gradual troops withdrawal after talks started. It was then that the LTTE launched its attack. Although the fighting rages, how long it will last and what course the conflict will take will depend on the LTTE's ability to sustain its current drive, particularly its ability to maintain its artillery barrage. Reports from the warfront state that the LTTE is able to fire artillery regularly and intensely. On the other hand, the ability of the armed forces to take effective countermeasures will also have a bearing. It seems likely that the conflict will be a prolonged one, with intermittent lulls nec essitated by logistical requirements. THE first stage of the LTTE campaign to take control of the peninsula was launched on December 11, 1999 (see "Tactical Shift", Frontline, January 7, 2000). The camps at Vettilaikerny and Kattaikadu on the east coast and Pullaveli to the north of E lephant Pass were taken in a land-sea joint campaign. An unsuccessful assault was conducted on the western flanks of Iyakachchi, but no direct attack was launched on the main base at Elephant Pass. The Iyakachchi camp, five km to the northwest of Elephan t Pass, is situated along a bend on the A-9 Highway. With the fall of Vettilaikerny, Kattaikadu and Pullaveli, the land-sea supply routes to Elephant Pass were cut off, and the only way through was along the A-9 Highway from Chavakachcheri. The LTTE cond ucted some limited operations that were aimed at stepping up the pressure on Iyakachchi without achieving any breakthrough. The second stage of the LTTE campaign, a multi-pronged assault, unfolded on March 26, 2000 (see "Another offensive", Frontline, April 28). A joint operation led by Vasanthan of the Charles Anthony Infantry division and Veerendran of the Sea Tigers took control of the Chembiyanpattru-Maruthankerny-Thalaiady complex that housed the 3rd operational headquarters on the Vadamaratchy east coast. These were on the land strip between the Bay of Bengal and the Jaffna Lagoon. The army then vacated the camp s at Maamunai and Amban; the soldiers relocated to positions to the west of the lagoon. THE LTTE unleashed a counter offensive code-named Operation Unceasing Waves IV,' last Tuesday September 26. Supported by heavy artillery and mortar bombardment Leopard' Commando units of the LTTE launched a six pronged attack on the Kilali-Muhamalai-Nagar Kovil axis from their staging areas at Alipalai, Pallai and Kudarappu around 1600 Hrs on 26 September. They succeeded in punching through the first bunker line of the three fortified defence lines which were established by the army following the fall of EPS in the LTTE's Operation Unceasing Waves III' in April/May. The army's southern defences extended from the strategic naval camp at Kilali on the Jaffna Lagoon to Nagar Kovil on the south-eastern shoreline of the Jaffna peninsula. Fierce pitched battles were being fought with bunkers and several army mini-camps falling and some bunkers changing hands several times. Having breached the forward defence lines, the LTTE spearheaded an advance of some 3kms on to Eluthumadduval through Muhamalai along the A9 Jaffna-Kandy road. Mig 27 Ground Attack Jets joined the fray around midnight, pounding LTTE positions. Battles were raging even on Wednesday with casualties mounting up on both sides. Both the military and LTTE exaggerate enemy' casualty claims while playing down the number of their men killed and wounded. Since independent verification is not possible, one can only consider the conflicting reports with liberal doses of salt.' Whilst the military claims that only 23 soldiers were KIA and 200 wounded in this LTTE counter-attack, LTTE claims to have killed more than 150 soldiers and wounded over 500. The government controlled Special Media Information Centre has so far given the casualty figures as 180 killed and 600 wounded since the latest outbreak of hostilities began on September 3. However, it is now common knowledge that, on the very first leg of Operation Rivikirana' more than 265 including seven officers sacrificed their lives and more than 750 were wounded. Operation Unceasing Waves IV,' also saw the LTTE gaining ground near the key naval pier of Kilalai, which is the southernmost point of the army defences in the Jaffna peninsula. These were the first military reversals the army experienced since the September 3 Rivikirana' fiasco. Though the military claims to have repulsed the LTTE counter-attack with the SMIC claiming to have killed 73 Tiger cadres for the loss of 23 soldiers killed and some 200 wounded, in Tuesday's battles alone, the reality may be quite different. Medical Corps and Sri Lanka Air Force Casvac sources say that dozens of flights were laid on for the evacuation of troops wounded in action. The almost constant drone of An-32Bs and Y-12s flying from the early hours of the morning and even late at night alert residents of Ratmalana, that something more than usual is up. The action in the Jaffna peninsula was not limited to the LTTE's Operation Unceasing Waves IV.' In the wee hours of Tuesday morning, around 0130 Hrs, SLA mounted an operation code named Kinihira II' moving on Maduvil, north-west of Sarasalai, some seven kms from Jaffna town. The objective of the operation appears to be to expand the army's area of control north-westwards of Chavakachcheri. By 0900 Hrs, troops regained a further 10 square kms of territory in Maduvil North, re-opening an important supply route to Chava; SMIC claimed 13 army killed and 45 wounded in the action. The army claims to have routed the LTTE and inflicted heavy enemy casualties with over 50 enemy killed in this action. In a diversionary attack, troops from Ariyalai attacked a LTTE bunker line killing twelve. Anuruddha Ratwatte, Deputy Minister of Defence was quick to make-hay-while-the-sun-shines. The sun did indeed shine upon the Sri Lanka Army, through the dark stormy clouds, which had beset them the weeks before. After the Operation Rivikirana' fiasco, in which the army took over a thousand casualties, the LTTE may not have expected the army's surprise thrust towards Colombuthurai on Sunday 10 September (particularly after the heavy losses inflicted upon the army by the LTTE). The army was able to wrest control of about 3ks further south-eastwards from their positions on the outskirts of Jaffna, taking Navatkuli and the Navatkuli Bridge. Ratwatte made it a point to maximise the mileage to be gained in the forthcoming elections by these tactical moves' and immediately flew to Jaffna on 12 September, joined by Lt. Gen. Rohan Daluwatte, Chief of Defence Staff and the three service commanders. Why Ratwatte did not join up with the group of journalists and cameramen in their guided tour of the battlefront on Wednesday September 20 is a mystery. He could have repeated his little number of jumping off' helicopters etc. Would have won him more votes than he would by the current operation he is conducting. Last Tuesday 26, another group of selected journalists were flown to Jaffna by the government, but they could not visit the area the army claimed it captured on Tuesday due to continued fighting in the area. During his visit in May, the deputy minister of defence went on record (on national television, at that) to blame the senior officers of the military (specially, those at Palaly HQs at the time of his arrival on the May 18). One would recall that Maj. Generals Janaka Perera, Sarath Fonseka and Nihal Marambe together with a host of other officers were rushed to north from their posts in Colombo in an attempt to stem Unceasing Waves.' It was their skill, expertise and efforts which in reality halted the terra at the gates of the city of Jaffna and turned the tide of the battle. Lines would have certainly been drawn on maps and positions marked thereupon to indicate their own and enemy positions, lines of attack, withdrawal etc. as they must, which is a standard practise and requirement in the planning and execution of any military operation. Having chosen the path of politics as his career and not the noble profession of soldiering and unfamiliar with such military practices, the Ratwatte may be excused for his ignorance. But he would be well advised that military operations require military decisions and not political decisions. The time and place for political decisions is not the battlefield - the cabinet or parliament is a more suitable forum for that sort of thing. By informing the general public on national TV, that, before his arrival on May 18, senior officers were only planning withdrawals and that he had to put a stop to the withdrawal mentality' and draw a line on the retreat and say that "the army will not move an inch back from the positions they held," the deputy minister demolished whatever confidence the general public had in the military. A military which is sustained by the public - by their taxes and their sons and daughters. A politician who has neither son nor daughter in uniform perhaps cannot be expected to understand this reality. It is indeed a great pity that the honourable ministers, elected members and those from the national lists, who claim to make great sacrifices, who feel burdened about the poor and downtrodden (going by the campaign speeches we hear these days from various platforms) and plead with the public for a chance to rule the roost, have not contributed their children to the war effort. According to government media reports, Ratwatte during his last visit to Jaffna, is supposed to have exhorted troops to maintain pressure' on the LTTE in order to retake lost territory in the Jaffna peninsula. It is this sheer irony of the fact, that, the person who is supposed to give political leadership to the troops in battle, which involves upping the morale and the fighting spirit of the troops, encouraging them in their efforts etc. goes and does just the opposite: which is tantamount to betrayal of the trust that the military has placed on their political leadership. Little wonder that, whilst soldiers are going AWOL (Absent Without Leave) in their thousands, officers too are putting up their papers in their droves. Due to this element of morale downing,' military commanders at all levels had their work cut out for them, to uplift the sagging morale of the troops. It was then left to the Multi Barrelled Rocket Launchers and Artillery which indeed helped, contributing both in their fire-power support and elevating the ebbing morale and fighting spirit of our troops. Troops having successfully thrust towards and taken Chavakachcheri in Operation Kinihiri' through Sankathaanai along the A-9 and towards Vannaathipaalam on the Kopay-Kaithady road, opened up a third front in the Colombuthurai-Ariyalai East axis, along the south-eastern side of Jaffna town. Within three hours, troops were able to take the outskirts of Chavakachcheri town, where the LTTE resisted the troop advance in fierce fighting. Artillery and mortars were in action throughout Sunday and well into Monday. Two counter-attacks launched by the LTTE were beaten back by the army with liberal use of MBRL rockets and massive artillery and mortar bombardment. The town of Chavakachcheri, the second largest city in the Jaffna peninsula, which at one time boasted of a population of over 100,000 was levelled to rubble and virtually a ghost-town with just the ruined shells of buildings flattened by artillery, mortars and rockets. There were no civilian casualties, for there were none within the city, as they had all departed during the LTTE offensive in May. Superior firepower prevailed and the troops consolidated their positions in expectation of the next counter attack by the LTTE. The tours arranged by the government for journalists (two in as many weeks) to confirm military claims that Chavakachcheri was in government hands has given credence to speculation that, the army is not only conducting a military campaign but also doing their bit (no doubt at the bidding of their political masters) of campaigning for the October 10 elections. The publicity derived will perhaps be helpful. Not only in the war effort but also in the political arena as well. In a war that has been fought spanning two decades, based more on political decisions' than on military strategy, in the run-up to the parliamentary elections, there is concern about the impact of the current round of military activity on the conduct of the polls, where it is becoming more and more apparent that, the timing of military offensives are determined by political imperatives. For once, both the deputy minister of defence and the chief of defence staff were united in their task - assigned to them by their commander in chief, theirs was to do or die' - perhaps not literally; but more metaphorically so - politically. In the face of heavy casualties on the first leg of Operation Rivikirana' on September 3, the military mustered its reserves and threw in all they had into battle, in order to achieve this objective. The month of September will no doubt go down in the military history of Sri Lanka as a campaign without equal. Never has the army mounted operation after operation, week after week. Operation Kinihiri-II is the fourth operation mounted in as many weeks. Prime Minister Ratnasiri Wickramanayake, a well known proponent of the military option,' is reported to have declared at a public rally during his election campaigning, that EPS (Elephant Pass) would be under government control by election day, October 10. Such a statement from no less a person than the prime minister, cannot be easily discarded as election rhetoric. Meanwhile, while all the attention was focused on the northern front and the election campaigning' the LTTE stepped up its operations in other areas including Colombo and in particular in the east. Unlike in 1994, when the army cleared the east in preparation for the then elections, today, the status quo has changed. As before, Prabhakaran may yet be a decisive factor in the forthcoming parliamentary elections, if not in the north, then perhaps in the east. The attrition in the east has been consistent and casualties have been mounting in typical guerrilla style operations where the claymore and the ambush reign supreme.